Reuters reported last week that "Most Christians living near Egypt's border with Israel [in the town of Rafah in Sinai] are fleeing their homes after Islamist militants made death threats and gunmen attacked a Coptic-owned shop." Photos of desecrated churches and Christian property show Arabic graffiti saying things like "don't come back" and "Islam is the truth." All media reports describe the same sequence of events: 1) Christians were threatened with leaflets warning them to evacuate or die; 2) an armed attack with automatic rifles was made on a Christian-owned shop; 3) Christians abandoned everything and fled their homes. On August 14, El Fegr reported that leaflets were distributed in areas with large Christian populations, including Upper Egypt, offering monetary rewards to Muslims who "kill or physically attack the enemies of the religion of Allah—the Christians in all of Egypt's provinces, the slaves of the Cross, Allah's curse upon them…"
As a testimony to just how safe the jihadis feel under Egypt's new Islamist president, Mohamed Morsi—who just freed a militant jihadi responsible for the burning of a church leaving several Christians dead—the leaflets named contact points and even a mosque where Muslims interested in learning more about killing Christians should rally "after Friday prayers where new members to the organization will be welcomed." On the same day these leaflets were distributed, a separate report titled "The serial killing of Copts has begun in Asyut" noted that a Christian store-owner was randomly targeted and killed by Salafis. For months, Arabic-Christian media have been reporting ongoing stories of Muslim "gangs" and "thugs" attacking Christian homes, abducting the residents, including women and children, and demanding ransom monies—not unlike what is happening to Christians in Iraq and Syria. In one particular case, the Muslim gang attacked the home of a Coptic man, "releasing several gunshots in the air, and threatening him either to pay or die." The gang "picked this specific village because Copts form 80% of its inhabitants." Such reports often conclude with an all too familiar postscript: Christians calling police for help and filing complaints, all in vain. A Coptic Solidarity report from August 20 titled "Copts in Upper Egypt Attacked, Beat, Plundered," tells of just that—how Christians are being beat, their businesses set on fire, and their properties plundered (see also here and here for similar reports). Likewise, according to Al Moheet, a new human rights report indicates that, in Nag Hammadi alone, there are dozens of cases of Muslim gangs abducting Christian Copts and holding them for ransom. Concerning these, the Coptic Church is daily asking for justice and receiving none. 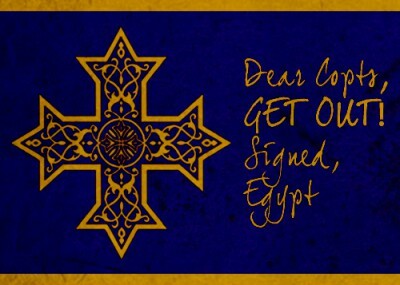 The exodus of Copts from their homes also has become an ongoing crisis, so much so that a recent statement by the Holy Synod of the Coptic Orthodox Church of Egypt lamented the "repeated incidents of displacement of Copts from their homes, whether by force or threat." The statement also made clear that what happened in Sinai is no aberration: "Displacements began in Ameriya, then they stretched to Dahshur, and today terror and threats have reached the hearts and souls of our Coptic children in Rafah [Sinai]." Indeed, back in February, a mob of over 3,000 Muslims attacked and displaced Christians in the region of Ameriya, due to unsubstantiated rumors that a Christian man was involved with a Muslim woman. Christian homes and shops were looted and then torched; "terrorized" women and children who lost their homes stood in the streets with no place to go. As usual, it took the army an hour to drive 2 kilometers to the village, and none of the perpetrators were arrested. Later, a Muslim Council permanently evicted eight Christian families and confiscated their property, even as "Muslims insisted that the whole Coptic population of 62 families must be deported." A few weeks ago in Dahshur, after a Christian laundry worker accidently burned the shirt of a Muslim man, the customer came with a Muslim mob to attack the Copt at home. As the Christian defended his household, a Muslim was killed. Accordingly, thousands of Muslims terrorized the area, causing 120 Christian families to flee. One elderly Coptic woman returned home from the bakery to find the area deserted of Christians. Rioting Muslims looted Christian businesses and homes. Family members of the deceased Muslim insist that the Christians must still pay with their lives. The same time the media reported about the displacement of Christians from Rafah, a quarrel between two school girls—a Christian and a Muslim—ended when several "heavily-armed" Muslims stormed the home of the Christian girl, causing her family and three other Christian families to flee the village. When the father returned, he found that all his saved money and possessions had been plundered. When he asked police for help, the officer replied, "I can't do anything for you, reconcile with them and end the problem." Indeed, this has been the same attitude of Egypt's Muslim Brotherhood led government: in all of the above cases, the government looked the other way, or, when called on it, denied reality. Thus the Coptic Holy Synod made it a point to assert in its statement that "nearly one month ago the media had published the violations against the Copts but the Egyptian authorities have not taken the necessary measures to protect the Egyptian families, who have the right to live safely in their homes." As for the Rafah incident—the only incident to reach the mainstream media—Prime Minister Hisham Qandil denied that Christians were forced to flee, saying "One or two [Christian] families chose to move to another place and they are totally free to do so like all Egyptian citizens." Such governmental indifference is consistent with the fact that, despite promising greater representation for Egypt's Christians, President Morsi just broke his word by allowing only one Copt—a female—to represent the nation's 10-12 million Christians in the newly formed cabinet. I See so many conflicts where Muslims are the sharp end. Once they chuck everyone else out they kill each other. History proves this...But think China. Once the church was chucked out missionary's felt all was lost,look at China now! Christians rise up in prayer! This is what happened to the Jews in Hitler's Germany. It is hard to believe it is happening in 2012. This is an outrage but this Adeministrration keeps it quiet. So this is what the Administration called the "Arab Spring", and that which it has assisted, nurtured and supported. Know the tree by its fruit. We have seen next to nothing about the persecution of Christians in the mainstream media or press. The seeming embrace by the Left of Islamism is a paradox, perhaps explained by understanding progressivism as an anti-Western mindset. Remember the chant of the student radicals back in the sixties and seventies: "Hey, hey, ho, ho, Western Civilization has got to go"? For many aging yet morally matured former young radicals, any enemy of Judeo-Christian tradtition is their freind. Of all the threats to western Civilization, the progressive movement is the greater. There is an infestation of this miserable mentality in our government and in our institutions. November sixth - be there! Thank you for this article, very eye-opening. It just goes to prove that the media is barely scratching the surface of Muslim attacks on Christians in the Middle East.